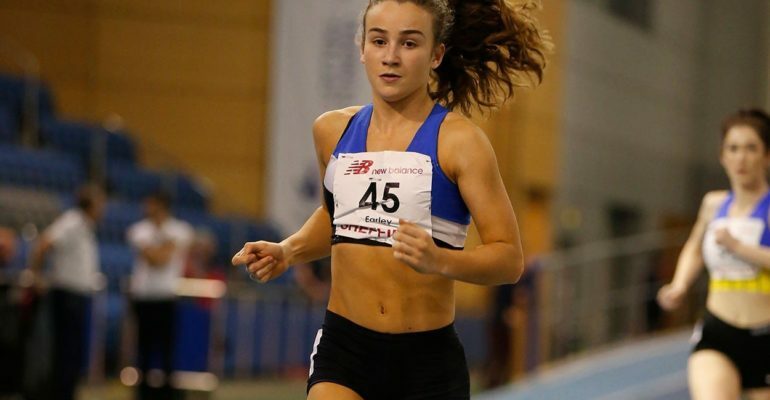 GLL Sport Foundation supported athlete Pippa Earley competed at the England National indoor Pentathlon on 11th March in Sheffield and broke the British record with a points score of 3,952. She also broke the British record for 60m hurdles on the 18th February at the Surrey Championships and won the National title later with a new championship record. 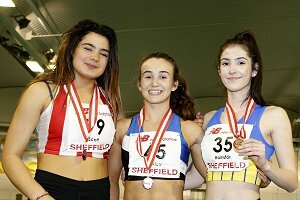 The EIS in Sheffield welcomed the under 17 men and women to compete in the 2017 England Athletics indoor combined events championships. The men competed in the first day of their heptathlon and 49 women took on a one day pentathlon which culminated in a new British Record for Pippa Earley (Club: Kingston AC & Poly Harriers, Coach: John Shepherd). With four pools in the field events and 8 races for each track event this was a packed day for athletes and officials. But the excitement held throughout and the audience were rewarded with witnessing a new British record! With four athletes of the 47 going sub-nine seconds in the first 60m hurdles event, including Pippa Earley, she had a great start to the day. The shot put saw Amaya Scott hold onto her lead with a 13m+ put but Pippa Earley was just 9 points behind in the event and in second overall going into the long jump where she finally gained more cumulative points than Amaya Scott. Indeed all three of her jumps were further than anyone else’s; it was now a possibility that Pippa could break the British Record as she only needed 2:25 in the final event – well within her 800m capability. And she proved her ability at the event – with a time of 2.18.52 – six seconds ahead of the rest of her race to take her final score to a record breaking 3,952. We are very proud to be supporting Pippa and look forward to seeing what she can do in the outdoor season.